For this card I used http://cardpatterns.blogspot.com/ #48. 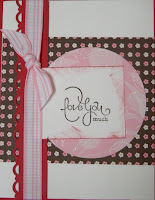 I started off with Whisper White CS and added some of the new Sending Love DS paper from SU. The sentiment is from the set Well Scripted. I finished it off with Real Red CS and Pretty In Pink ribbon. Enjoy the week and thanks for stopping by. Wow Holly, you have been very busy. Great cards.